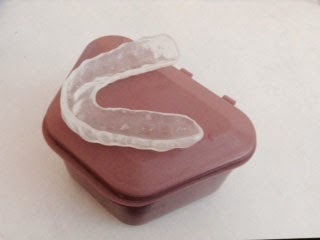 I went to the dentist today and received my jaw guard to wear at night to prevent my teeth from grinding and possibly help with the TMJ disorder I started having after the brain injuries... it will be a year in two weeks, I have mixed feelings about it - both happy and stressed, as I will be having eye muscle surgery to correct the double vision I've had for a year. I had cognitive testing today with a neuro-psychologist to measure my ability to reason, make decisions logically. I have to say it was intense neurologically. My functioning has been impacted in some ways from what happened to me. Some things I am able to do such as read, write, follow directions. I do have some short term memory issues and solving problems. I will try the plastic teeth thing I was given today when I go to sleep tonight. Curious to see how/when it relives my TMJ issues. My new jaw splint which I received on Friday. I am suppose to wear it at night.